ll three are designed to improve competency and help us meet the needs and expectations of our Clients. 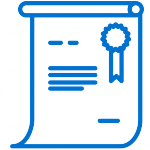 We understand and appreciate that everyone has different preferences for learning, whether that’s reading, gamification, tutor led or e-learning. So when delivering our Dealer Education solution for our Automotive Clients, we use a variety of methods to support all types of learning. In 2010, Percepta took over the management and delivery of our automotive Client’s Dealer Academy, a facility which delivers both sales and service training across our Client’s dealer network in the UK. The facility contains 16 classrooms equipped with cutting edge technology, a state-of-the-art showroom and a 200 seat auditorium. Four workshops equipped with the latest tools and equipment ensures our technical staff receives the latest information on the latest products from the brand and various component manufacturers. Our training covers product excellence, sales and leadership skills, technical maintenance and repair skills, non-technical skills and aftermarket care. We also have a range of tailored apprenticeship programs. Our blended training solution includes a combination of trainer led, digital media and seminar-type events including vehicle launches with more than 2,000 delegates, seminars for the 100 top managers across the region and assessments for competence at all levels of staff in the dealer network. 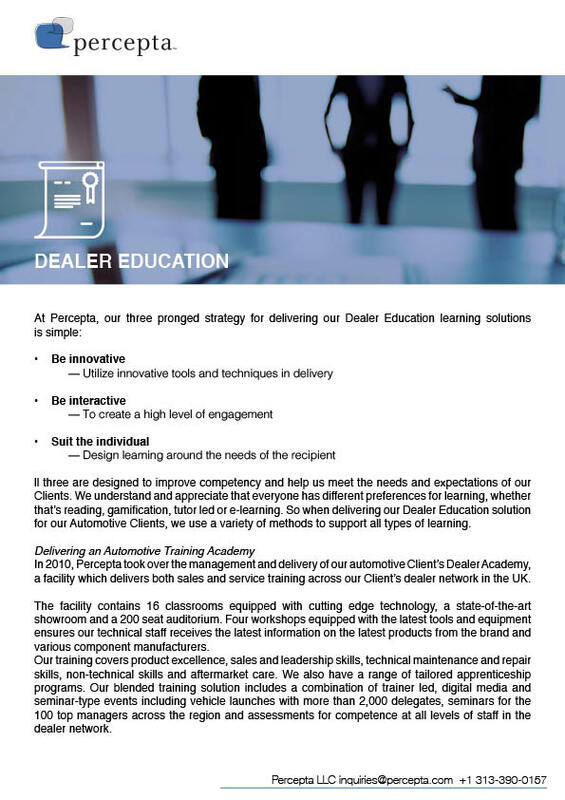 Our partnership with the Client is invaluable to the training we deliver and together we have transformed learning pathways, looking closely at how each dealer technician and sales staff member can move through the curriculum to bring the greatest value to them and their dealership. We focus on their motivation to progress through the ranks and at every stage, seek their input and feedback to continuously improve and develop. Their loyalty to the brand is as important as the loyalty shown by our Client’s customers. As with all Percepta solutions, our people are our true competitive advantage. They are highly empowered and know our Client’s products as well as the dealer network. They work together with a number of other key stakeholders across the Academy, understanding the needs of others around them and sharing best practice when needed to strengthen the training they deliver. In fact, at every opportunity the team benchmarks their performance to ensure alignment with the automotive industry. Much like the training they deliver, the Academy team is forever evolving and focuses on identifying key retail and digital learning trends that may impact the Academy in years to come.